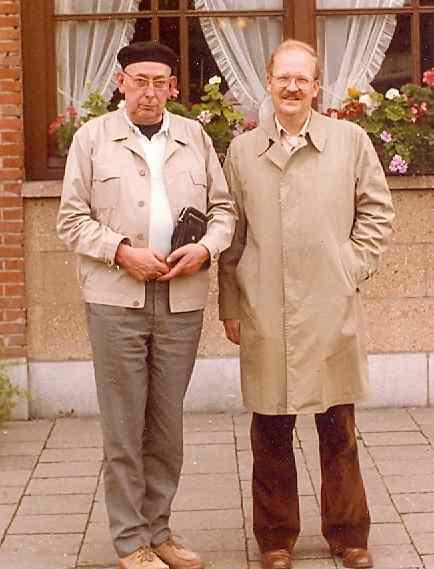 A picture from my 1985 visit to AV Leo Cornelissen in s'Hertogenbosch (Den Bosch), Netherlands. Leo was very interested in the designs of Lufsky. In addition he was very active in the CVA (Club of Anker Friends). In 1986 AV Probst, München, Germany, informed the CVA that Lufsky had died in München just two months ago. Fortunately AV Probst had all of the Lufsky papers, including the designs for a never produced set NS 18A, as well as his original drawings for the smaller NS sets. These papers were lent to Leo. Leo wrote a series of articles on these Lufsky designs, starting with the designs for this NS 18A set. Only one such set existed, Lufsky's own set; it was lent to Leo so he could construct these Lufsky designs. Starting in MLB # 36 (Dec. 1986), Leo wrote a series of articles on the NS designs based on this new information. All of the original NS 20 (18A) Lufsky drawings are in the CVA Anker Internet Archive. Computer drawn versions are on AV Abel's web site - Ankerwiki. On the builder's page, you will find pictures of these NS 20 buildings. I am using a new web page program: Microsoft's Expressions. The New Stone Era (Die neue Steinzeit) are available in the USA! At the Treffen (meeting/open house) at the Anker factory in Rudolstadt, Germany, it was clear that the kids loved these new Anker stones. I was particularly impressed with the popularity of "X-Men". They came up with the most fantastic structures -- all free style. The GoKi partners, the owners of the Anker factory, know children's toys and what appeals to children. They had tried X-man in wood, but wood broke and was not stable enough. Anker stone X-men are solid and not easily broken. A link to the USA wholesale agent for The New Stone Era (Die neue Steinzeit) has been added to the list of links at the bottom of this page. And, of course, The New Stone Era (Die Neue Steinzeit) sets are now available in the USA, including here on-line. New sets are being introduced rapidly. These sets are intended for young children, not the older children and adults who enjoy the traditional Anker sets. But the New Stone Era sets are very important, because they introduce Anker to the new generation. And the Starter Set provides a transition to the traditional Anker sets. They are a perfect gift to children and grandchildren -- introducing them to the enjoyable hobby of building with Anker sets. If my eldest granddaughter is typical, a perfect first gift is the small dinosaur (DINOSA) set. Young children are fascinated by dinosaurs! Jerry Slocum has written The Anchor Puzzle Book. It is a very important book on Anker -- not just the puzzles, but also F. Ad. Richter & Cie. The carefully researched history of the Anker puzzles also adds to our knowledge of Anker Stone Building Sets. Buy the book; you will not be disappointed. Reserve a book for delivery at the CVA meeting in Hilversum on April 26th, the meeting in Traiskirchen, Austria, or the Anker Treffen in Rudolstadt on September 6th. The CVA Anker Internet Archive is on-line. In addition to the scans and other Anker information, this archive provides links to most other Anker sites on the Internet. It is getting better every week and is still being worked on. The intent is to put all digital Anker information on this site. The last CVA meeting was held on Saturday, April 26, 2014; Hotel Lapershoek in Hilversum, Netherlands. The next CVA meeting: Saturday, October 18, 2014. The location is unchanged -- Hotel Lapershoek in Hilversum, Netherlands. Gotisches Haus, D-13597 Berlin Spandau, Breitestr. 32. The Austria Anker/Matador friends meet at the Stadtmuseum Traiskirchen once a year. I do not know the schedlue. An Anker Treffen was held in Rudolstadt on Saturday, September 14, 2013, at the Anker factory in Rudolstadt, Germany. The additional get-together at Hodes, Mörla, on Friday was a lot of fun. The next Anker Treffen in Rudolstadt will be on Saturday, September 6, 2014. There will be a get-together at Hodes, Mörla, on Friday, September 5th, starting at 6:00 PM. Be early, many AVs are. A new and important Anker web site: János Végh <vjbp3400@yahoo.com> of Hungary has created a web site which could well become the main Anker Stone Building Set web site. The plan is to make everything available as well as provide links to all other Anker web sites. I urge everyone to take a look. Now! More Anker information now on-line. The Internet is even more convenient than ever. You can now download the entire CD-ROM archive, plus a lot more, from the new CVA Anker Internet Archive web site. More than 6 gigabytes of data are there, including everything that was on the CD-ROMs. The CVA archive on CD-ROMs has been discontinued. Use the Internet! A new feature is "Änderung" -- it contains a list of changes to the CVA Anker Internet Archive. And you can download my book as a PDF file -- English version or German version. I have converted the book from AmiPro to MS Word. And I am updating and revising it. The revision, when completed, will be on line for download. Many of the new designs for currently manufactured sets can be downloaded from of Andrea Mazzocco, Switzerland. Here is a list of most (never "all", when discussing the Internet) Anker sites: ankerstein.ch/archiv: The majority of Anker information. The best place to look. ankerstein.ch/forum: An open forum on which AVs can post information, questions and answers. ankerstein.ch/org/index.htm: The archive of all editions of ankerstein.org – on line since 1993. ankerstein.ch/html/patente_.html: A list of Anker/Richter German and American patents. ankerstein.ch: Other links to Anker information. clubvanankervrienden.nl/: The CVA’s official web site. ankerstein.org: A monthly Anker “e-zine”, since 1993. Also an “official” CVA web site. ankerstein.de: The Anker factory’s web site. ankerstein.cl: Anker information in Spanish. ankerbaratai.hu: Anker information in Hungarian. nikhef.nl/~i56/Anker.html: Fred Hartjes’ web site with Anker information, including the history of Baukunst im Kleinen (BiK). ankerwiki.de: Andreas Abel’s web site. Presents most of the GK-NF plans redrawn using AnkerPlan. ankerstein.ch/downloads/index.htm: Building plans be AVs, including the building plans from the CVA sponsored Baukunst im Kleinen (BiK). ankerstein.ch/downloads/CVA/Book-PC.pdf: George Hardy’s book on Anker Stone Building Sets. ankerstein.ch/downloads/CVA/Buch-PC.pdf: German translation of George Hardy’s book. There are a large number of short Anker videos on YouTube. Here is a link to one of the videos. You can use the "related videos" suggestions to find many more. The New Stone Era: The factory has introduced a whole new series of stone building sets -- The New Stone Era (Die Neue Steinzeit). These sets are intended to introduce young children to Anker and Anker Steinbaukasten. The new series could be considered as a reaction to the reality that the reputation of Anker Stone Building Sets as wonderful educational sets has expired. No one remembers them -- not even as toys their grandfathers owned. In 1960 the DDR factory produced an anniversary model of the Wartburg, in honor of that castle's 600th anniversary. That set is almost impossible to find today; only two are known. I had an opportunity to buy one in 1979 when I toured the Wartburg. I should have bought one, but it seemed over priced at about, as I remember it, 60 VM. Just a few months ago, my bid on eBay.de of more than US$ 500 did not win. (Does anyone doubt that there are more sets in the inventory room of the souvenier shop in the Wartburg, Eisenach, Germany?) You have been warned! You will remember the set much longer than you will remember the money. The set is available only from this special web site. AV William Seppeler has established an important web site/blog which provides designs for small sets and collections. If you have just a set # 6, or the even smaller Brownie (Heinzelmännchen), you must check out this side. Someone visited this blog and created animated assemblies of some of the designs. All Anker builders should look at it to see just how much variation is possible to a designer with a great imagination. New plans for set # 4 are on the site. The Richter villa is closed. The Spielhausverein has moved, and the villa is now owned by the heirs of Eversbusch. All of the Anker archive materials being housed there and the collection of Anker sets have been moved to Heidecksburg or the Rudolstadt City Archive in the old city hall (altes Rathaus). The large collection of old Anker stones, many of which are quite rare, was left in the possession of the Spielhausverein. It is my understanding that these stones have been sold. The large Wartburg model is in storage in the Heidecksburg; the smaller model was returned to its owners -- Aeropharm in Rudolstadt. The Mosaic Set is available only at the factory. I do not plan to buy sets when I attend the Treffen. The cost is high -- € 400 (about US$550, including postage to you). This set contains 547 stones in four colors and is intended for floors in Anker buildings. The set is identical to the set Mosaik Set # 4 from the original factory. 547 stones means that the set is expensive, but Anker buildings look very nice when they have floors on the porches and entrances. For those of you who are interested, here is a picture of me, my granddaughters, and my cats. Yes, I have three granddaughters and "new" cats. My picture is relatively new, taken in October, 2008, on a trip to Antwerpen. There is also a new cat picture. BTW, after reading The Facebook Effect, I signed up. I am still looking for pictures from other countries. Anker stones are now popular in Korea, and pictures have been received. So far, I have not received pictures from South America (other than one old collection in Argentina), Asia (other than Korea), Australia or Africa. Since Anker was popular worldwide, and it still is, there must be some AVs on these continents. AV Rob Buis has been producing reproduction metal parts of the highest quality. To find out which ones are still available you should e-mail AV Rob Buis. If you want to build Anker bridges using nickel-plated iron parts, you will find that most of the original parts are rusted, often bent, and very hard to use. I build with Rob's parts. Contact Rob for more information about his new Anker metal parts. Rob has a web site for his reproduction metal parts. This web site is newly revised and expanded -- with a lot of beautiful pictures. He has also established a web site for box # 10 and box # 10B. Aeropharm is a division of Hexal. All of Hexal has been acquired by Sandoz. Sandoz (which is part of Novartis) is increasing its investment in its Rudolstadt operation. The production facilities in Rudolstadt are quite large; many Anker friends note the direct connection between this factory and Richer's Anker Works (Ankerwerke). Aeropharm and the factories in Schwarza are the largest employers in Rudolstadt area. In addition, every year, the new Anker factory in Rudolstadt, Germany holds three or four "Treffen", or "open door days", at that factory. The Treffen in September attracts many Anker friends. In 2012, the Treffen attracted far more attendees than usual. The Club of Anker Friends (CVA) has published a Stone Catalog. The new printing has been done, and the catalogs have been sent to CVA members. There are 4 CVA Stone Catalogs left for sale!!! Just ask for one! There is already a list of pages being revised. Not major omissions, but changes are worth making. This catalog is available only to CVA members. The amount of additional work to do continues to grow; the discovery of the original molds has added even more work. I saw molds which were used to make a stones I had never seen -- not even heard of. The molds were a pair -- a corner stone and a rectangular stone. The new factory has made a few samples of each. Of course there was no way to know the correct thickness. Close examination has shown that these stones are a new design for the roof stones of the DS (Dachstein -- roof stone) sets and allowed me to determine the intended thickness. The CVA is in the process of developing a "Stone Market". As it develops, CVA members will be informed, which means not on this web site. The mechanics are complex, so there may be several revisions before its process becomes routine. The stones are now being kept in Den Haag (Rigolettostraat 28). Richter's Anker Stone Building Sets (Richters Anker Steinbaukasten) were the world's most popular construction toy from the early 1880s through W.W.I. These building stones were made in Rudolstadt, Thuringia, Germany, (and at the company's branches in Vienna, New York , but not St. Petersburg, Russia). Starting in 1880, Richter's Anker building stones were covered by international patents and trademarks. AV Burkhard Schulz, Ellerau (bei Hamburg), Germany, produced a wonderful video entitled Ankerstadt Rudolstadt. He gave a copy to the CVA Archive, and it is possible he might let you have a copy if you want one. Americans remember: 1) the video is in German and 2) the German TV system is not compatible with the USA TV system. Today, there are many collectors and builders using Anker Stone Building Sets. These collectors often participate in setting up Anker displays at various exhibitions. Many Anker collectors are members of the international Club of Anker Friends (Club van Ankervrienden), a Dutch club with members from the Netherlands, Belgium, France, Denmark, Chile, Canada, Hungary, Germany, Austria, Switzerland, Sweden, Great Britain and the USA. The meetings of the Club of Anker Friends are held in the Netherlands. Over 600 different Anker Stone Building Sets were produced in a number of different series. In addition Richter offered other "stone" products such as puzzles and laying games. Information on these building set series is provided here, but one can e-mail me on other Richter products. People who would like to know more about a specific set, including value, or are only interested in additional general information are urged to contact George Hardy. All e-mail questions will be answered, to the extent of my knowledge. Sets and puzzles are being produced again! The quality is high. I urge people interested in starting Anker building, and those who want to provide their educational benefits to their children, to consider buying new sets. Anker Stone Building Sets are great presents, and the supplement sets make wonderful follow up gifts. These new sets recently won the 1997 Parents' Choice Gold Medal. In 1999, the Anker sets won the National Parenting Publications Award. For an 1880 toy to win in 1997 and 1999 says a lot about the quality of these sets and Anker in general. These sets are a perfect supplement to computers. For those who are really interested in Anker stones, I have written a book about them -- ISBN: 0-9656288-0-9. (I just got tired of either looking up the same information again and again, or trusting my memory on specific details such as dates and names.) It is expensive, $60 (or 40 Euros, your choice), ppd, because I print it myself on my PC and color ink is expensive. The book undoubtedly contains far more information about Anker stones and sets, the Richter company, etc. than you'll ever want to read. This book is a lot of work to print (I print about a dozen at a time, in either English or German, and it takes a week, full time. ), so please don't think I am urging you to buy one. The book is also available on CD-ROM, which costs just $2.00, or as a download -- English version or German version. Web Page Notes: Most subpages do not change from month to month. The "builder's page" is revised every month. A few people have asked me to number the "issues" of the Anker page. Well, they started in August, 1996, (with Vol. 1, # 8, to keep the number of the month the same as the issue's number). The number of this "issue" is shown at the top of this page. All web pages are found in the CD-ROM Archive. See below. CD-ROMs are no longer available! You can now download almost the entire CD-ROM archive from a new web site. The CVA's Internet Archive: More scans are being added all of the time, and the "holes" in the documentation are being filled. For CVA members only, there are the old MLBs and AHNs, plus the CVA Stone Catalog. (You need information, such as the web site, the code word, the password, to access them. Do not try unless you are a CVA member. Membership is checked!) All scans are JPG; many documents are PDF files. If you cannot find what you want on the Internet, feel free to e-mail me. The new Anker factory in Rudolstadt, Germany, has added many new designs to its web site (thanks to the help of the CVA BiK committee and the late Burkhardt Schulz). They can be easily downloaded, as they are PDF files. Please note that this home page is revised monthly. Most of the graphics are JPEG, which improves quality and reduces file size. The URL name -- ankerstein.org -- indicates that this site is the official web site of the Club of Anker Friends. Many new graphics, and additional text, are uploaded once a month, as close to the first as possible. I do not change the full set of graphics, as most people never read beyond the first page. If you only have a little time, I urge you to take a look at the "builders" page. And please plan to drop by monthly to see the new pictures. In the restricted space of this web site, I can provide only a limited view of the wonderful world of Richter's Anker stones. who have created their own designs are invited to send them to AV Fred Hartjes. This web site contains additional Anker links. the puzzle web page is a must for all puzzle collectors, although not much on Anker puzzles. For the month of July, 2014. "Anker" and "Anker" are registered trademarks of the Anker Steinbaukasten GmbH. Thank you for visiting the CVA "Anker" web site.